Two artists teams were selected for this project. Angelina Marino-Heidel and Joel Heidel were commissioned to create artwork for the bike shelter while Addie Boswell and Matthew Cartwright were commissioned for the plaza and waste receptical screen art. “Accessing Knowledge”, created by Angelina Marino-Heidel and Joel Heidel, projects the accessibility of knowledge made possible through our library system. 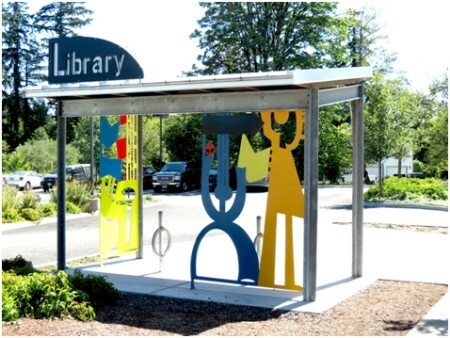 Offering easy access to those wishing to utilize the bike shelter, the artistic steel panels are positioned to maintain clear site lines, addressing visibility and safety concerns. The imagery and Marquee’s are both way-finding mechanisms and relate to library themes. Designed to complement both the contemporary architecture of the main library structure and the industrial look of the bike shelter itself, the architectural art screens and signage tout bolts and a minimalistic approach. Within the body of the work, on the larger of the two panels, ideas of musical notes and fonts are captured in rhythmic shapes identifiable as people. The strikingly different colors employed are an acknowledgement to the diversity that comprise a community. By choosing color combinations that create tension, we are reminded that our individual differences act as counterparts to each other, ultimately resulting in a richer and more complete society. The brightness of the colors suggests the illumination of thought. The smaller panel facing the parking lot, represents the accessibility of knowledge. Here we see books literally floating on our fingertips. While the abstract movement of two hands rising can be perceived as an action of desire and attaining intellectual growth, within the movement of the hands, a key hole/porthole to the journey of knowledge becomes visible. While comprised of two flat screens and two signs, the artistic intent was to create a three-dimensional sculpture. The concept is that the installed art work elevates the structure and the shelter itself becomes the sculpture. Delightfully, the sculpture offers varying visual combinations when viewed from different perspectives. Because of the open nature of the art works’ design it interacts with the landscape and is a window to the interspersed movements of children at play and people coming and going to the library. Created by Addie Boswella nd Matthew Cartwright – The aim of our art is to lead people from the park and parking lots to the library entrance, and we chose to show silhouettes of real people pulled in this direction. The silhouettes are grouped into three different vignettes, but all remain intent on their stories, oblivious to the patrons who walk past them. 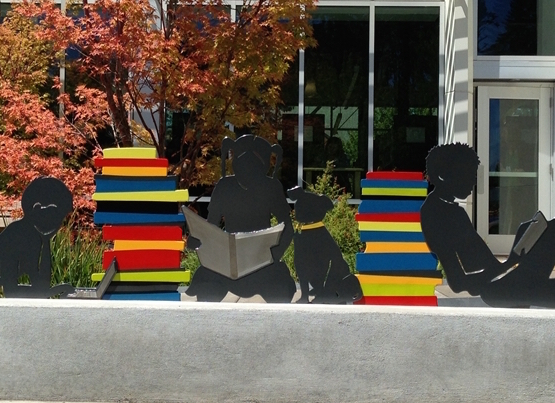 We hope these sculptures capture the child-like feeling of joy and anticipation that everyone feels when approaching the library or opening a new book. 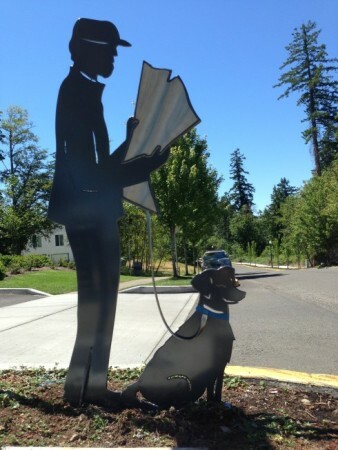 Figures are based on original sketches of various library patrons, which were then transferred to paper cut-outs before being water-jet cut from steel plates. The silhouettes are powder-coated in a dark grey tone to match the library building and its organic elements, with stainless steel and bright paint used sparingly to draw attention to the books, newspapers, tablets, and other reading devices the people carry.